Please call or email for further information about our programs and pilgrimage planning. The Black Hills are an endless source of beauty, wonder, and spiritual wisdom. Plan a visit soon. 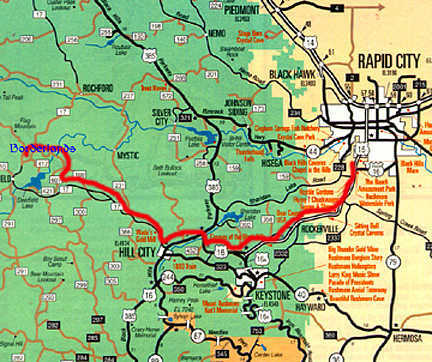 We are located 17 miles due west of Hill City, about an hour drive from Rapid City. The Rev. Linda J. Kramer, founder and director of Borderlands, does the program planning and cares for the ranch. An Episcopal priest, Linda received a grant in 2000 for Dakota Pilgrimage from Louisville Institute and directed The Pilgrimage Project in the Diocese of Washington (DC) from 2000-2004. She was educated at Colorado Women's College, Virginia Theological Seminary and St. George's College, Jerusalem. Formerly Canon to the Ordinary and Coordinator of Theological Education for the Diocese of South Dakota and Coordinator of Training and Education at the Alban Institute in Washington, DC, Linda seeks to build an interfaith, intercultural, and intergenerational spiritual community through the programs offered at Borderlands. Borderlands is a pilgrimage destination site for individuals and groups and offers retreats for youth, women and men, a spiritual development and leadership program for girls and boys ages 10-18; sabbatical lodging, spiritual guidance, directed or solitary retreats, life coaching and educational events.